Blockchain has much more to it than cryptocurrency. One of its most important features is the absolute transparency of the transactions, leaving no place for bribery and corruption. Real estate and investments into it are one of the industries that can benefit from using Blockchain the most. Propy, a US-based start-up, created by a group of prominent American real estate businessmen and experienced Ukrainian developers, begins the pilot project that will allow people invest into real estate and buy it abroad in a much more secure, convenient and fast way than ever before. 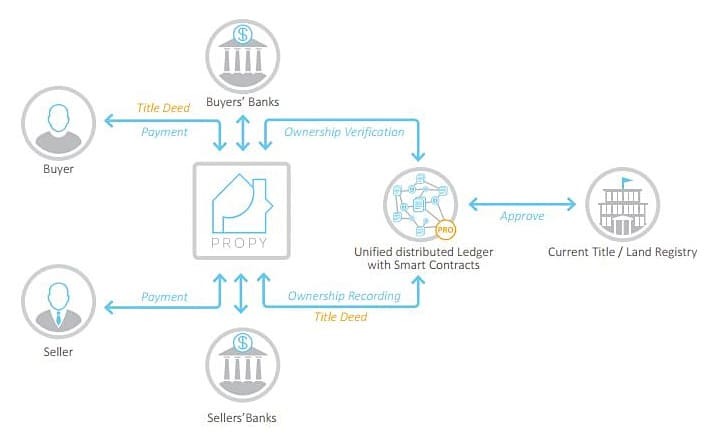 Founded in 2015, Propy aims to create a decentralized marketplace for buying real estate internationally and processing these cross-border payments using the power of blockchain. This project caused some traction in the media and was covered in Forbes, Huffington Post, and real estate-centered Inman. How does the blockchain help invest in real estate? In the beginning of 2016 Propy has released a working prototype of the blockchain-based transactions ledger and on the 15th of August, 2017, they held an ICO and issued 100 million tokens worth $1 each. 8 million of these are bought out as of 15th of September. Around October 2017 the company is going to launch a pilot project in Ukraine, whose moratorium on land trading has the bureaucratic complexity of the process as one of the main reasons. Propy has the full support of Ukrainian e-government division on the matter. A contract with the Chinese government has also been signed, as Chinese investors are ready and willing to invest trillions of USD into real estate development worldwide. Propy brokers will have their fixed commissions from successful sales, so it will be a win-win situation for all parties involved. This is one of the first real-life applications of the blockchain technology outside of the cryptocurrency market. The marketplace will help with property search, cross-border payments, have blockchain ledger integration for the ease of governmental use, and make online issuing title deeds cost-efficient, instant and secure. Should you like to use this opportunity, feel free to become the Propy investor and participant. However, maybe you have an idea of your own on how to use blockchain in some other industry? We have already accomplished several blockchain-based projects and gained quite an expertise on the matter. Feel free to contact It Svit to make your dream come true! Next10 hot trends of Big Data Analytics for 2017 Previous Ride the DevOps wave!